May 31, 2018 studio visit with James (right) and writer James Martin (left). 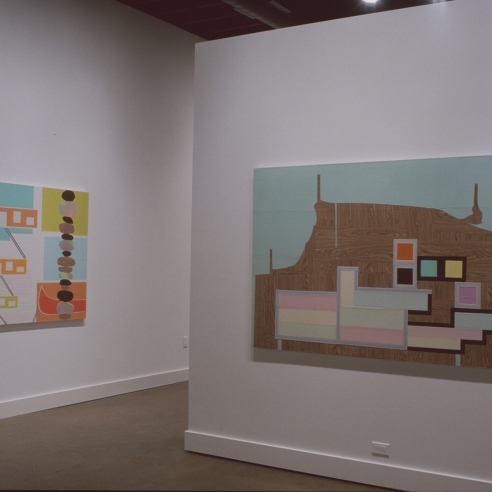 Two paintings in the background that were selected for the retrospective, 2008 and 2011, respectively. James Brinsfield was born in Chicago and lived in Massachusetts and Germany as the son of a career military officer. He earned a BFA from the University of Illinois at Chicago and an MFA in painting. 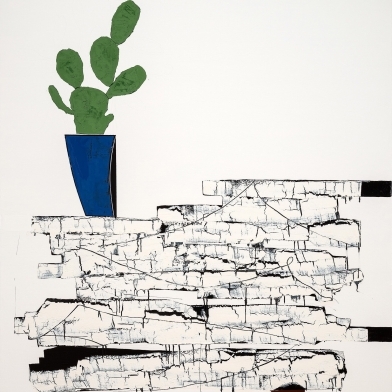 Brinsfield has had many solo exhibitions thus far in his career including exhibitions in Chicago, Kansas City, Los Angeles, and Washington, D.C. His work has been critically reviewed nationally including in Art in America, Art News, Flash Art, and Contemporanea magazines; and in the Chicago Tribune, Kansas City Star, and Washington Post. His paintings are in numerous public and private collections including the Museum of Contemporary Art, Chicago, the Nelson-Atkins Museum of Art, Kansas City, MO, the Nerman Museum of Contemporary Art, Overland Park, KS and the Kemper Museum of Contemporary Art, Kansas City, MO. For many years, he was a lecturer in the Painting department of the Kansas City Art Institute. Mr. Brinsfield currently has a twenty year retrospective exhibition at Joseph Nease Gallery on display through September 22, 2018. See our Exhibitions page for more information.  And see our News page for a May 21, 2018 television interview with JNG about the retrospective. Finally, see the essay by James Martin for this exhibition - link is below the resume at the right. 1990 Anton Gallery, Washington, D.C.
2012 Liberty, the Dolphin Gallery, Kansas City, Missouri. 2009 Interchange, Kemper Museum of Contemporary Art, Kansas City, Missouri. 2009 The Francis and Julia Spiezer Collection, Rockford Art Museum, Rockford, Illinois. 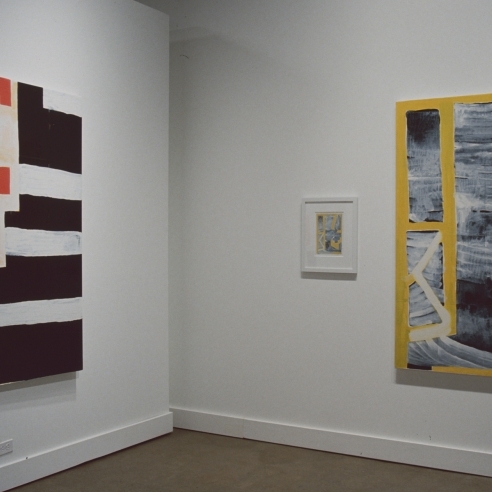 2008 About Abstraction, Salina Center for the Arts, Salina, Kansas, curated by Heather Ferrell. 2008 Conversation Pieces, Kemper Museum of Contemporary Art, curated by Chris Cook. 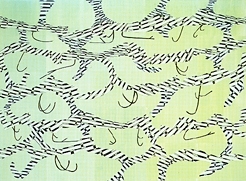 2008 Inman Gallery, Houston Texas, curated by Elizabeth Dunbar. 2007 Allusive Abstraction, Nerman Museum of Contemporary Art, curated by Bruce Hartman. 2003 Is/Was, Joseph Nease Gallery, Kansas City, MO. 1999 Perspective Kansas City, Gallery of Art, Johnson County Community College, curated by Raphael Rubinstein. 1997 Perspective Kansas City, Gallery of Art, Johnson County Community College, curated by Dan Cameron. 1995 50 Years of Chicago Art, Museum of Contemporary Art, Chicago, Illinois. 1982 New Figuration in America, Milwaukee Art Museum, curated by Russel Bowman. 1978 Chicago and Vicinity Show, Art Institute of Chicago, Chicago, Illinois. Curated by Roberta Smith and James Speyer. James Brinsfield has been busy in the studio in 2019 and has recently completed two new major paintings. 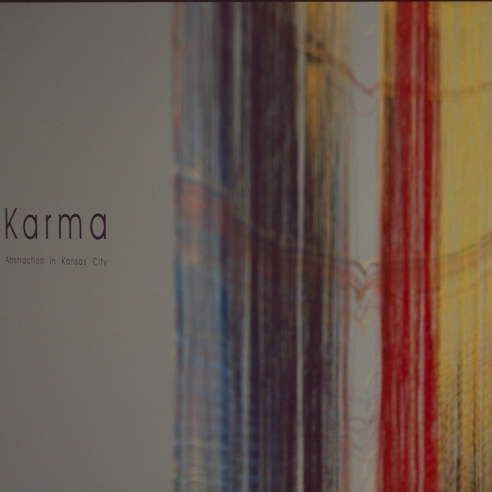 Both are being exhibited this month in Kansas City at Museo, a high end furnishing retail location. If you are in the area, hope you can stop in and see them paired with appropriate interior furnishings. See James' artist page on our website, or our Artsy site for full images of these two 2019 paintings - "Ametora" and "Hat and Beard". 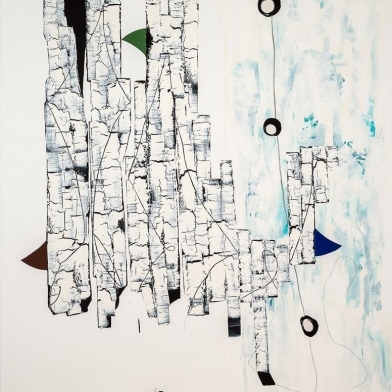 In conjunction with James Brinsfield - A Twenty Year Retrospective, James Martin has written a thoughtful essay about the work and how Brinsfield's abstract painting has cultural relevancy. We invite you to read the essay at this link. 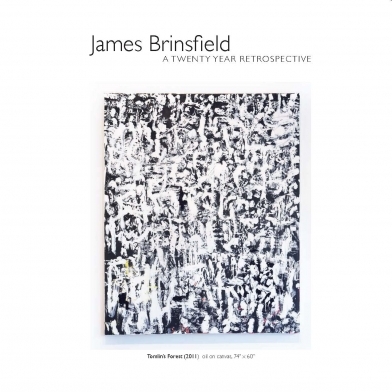 We open James Brinsfield, a retrospective of work over the past 20 years, to the public on June 23. We will be heading down to Kansas City to select the work for this exhibition late this month. This will be an interesting exhibition to see the evolution of this painter's work over a long period, and we will bring out some gems not seen in public for a long time. 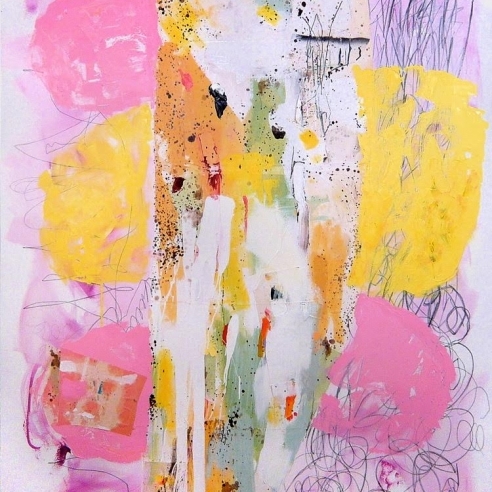 Jim is currently part of "Anxious Abstraction" at the Nerman Museum (see News item below). He is painting a new work for the exhibition as the painting at right (detail shown) is going to a collection in Houston. 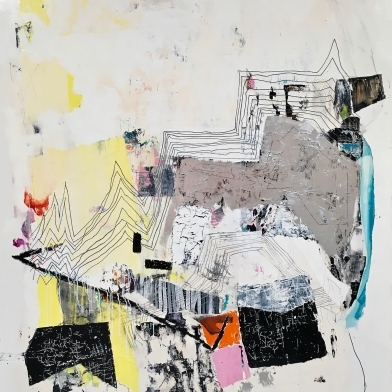 March 21, 2018: James Brinsfield in "Anxious Abstraction"
"Anxious times breed anxious art..." writes Alice Thorson about this six person group exhibit "Anxious Abstraction" at the Nerman Museum of Contemporary Art in Overland Park, Kansas. Mr. Brinsfield is one of six national artists included in the exhibition. At right is a detail of "Blue Vase" 2017, one of Brinsfield's included paintings. A link to the Nerman exhibition page is below.